Alisan Porter from Team Christina sings original song ‘Down That Road’ on The Voice Season 10 Finale Top 4 live performance show on Monday, May 23, 2016. “It’s a great song. Your voice is the voice that deserves to win. You do have an incredible voice. I thought it was really beautiful,” said Adam Levine. “That’s a cool song coming from your story. It’s really cool to see you connect to the song you wrote,” said Blake Shelton. “You were born to do that. You are the epitome of The Voice. You deserve to win and you are here to prove what it takes,” said Christina Aguilera. 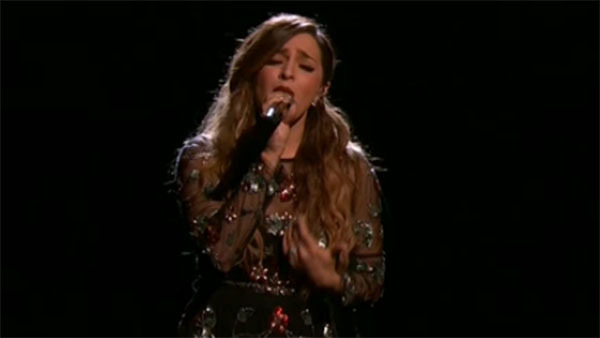 Did you like Alisan Porter’s original song? Share your thoughts and views on the comment section below.